So this week we have had a super moon where awesome things are supposed to come our way, big changes which we hoped and pray for. I did a lot of thinking this full moon as I often do. I take time out on my own, just an hour or two with my thoughts and write things down. It helps to get things clear on my head, I definitely feel more positive when I can see her beauty and light shining down. These days I can rarely sleep over the few days before and after the full moon has visited. It isn’t excitement although each one does fill me with renewed hope that I will achieve my goals, however small and insignificant they may be to others. After another almost sleepless night I felt compelled to sketch, well write actually, the things that I want to let go of. The things that do not serve me and that I want to see much less of. This is my first version, the one that contains hope for the future. There is another, which I will burn ceremoniously to rid myself of all the things that I want to be gone from my life, that have dragged me down for too long. It’s embers being sent off into the atmosphere along with the bad stuff. Cleansing my future and making way for an abundance of good things to take its place. It is becoming my ritual to set myself free and set my intentions. 25/6/17 After a week of feeling exhausted with high levels of pain and very little sleep I was met with an inspired moment. So this weekend’s sudden burst of creativity has come about by this…. A small pot of local flowers from my garden which either looked pretty or smelled nice. I thought I might be able to make some pot pourri to send to my friend in Australia as part of her birthday gift and to remind her of home. I miss her even more since she emigrated. Yes I have lots of wild flowers which have grown in the wrong place (otherwise known as weeds) but they are blooming and some of them smell rather lovely too so I’m not afraid to include them. Unfortunately I then looked it up and found out that you cannot send plant matter to Australia since they have strict laws. 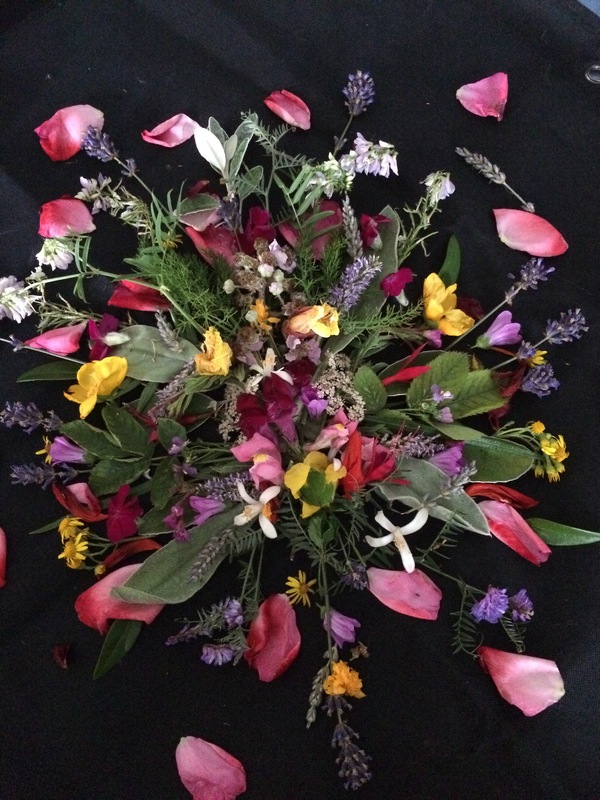 So I thought about making her a wildflower bouquet mixed up with the ones from my garden and photographing it for her. Perhaps I would make it onto a notebook so she can write a journal, or get it printed for her and put in a frame. Who knows but on our evening walk we collected more and since it was a rainstorm by the time we arrived home I had to store them in the fridge overnight and so this was made today. It adorned my dining table for the day as I wasn’t sure exactly what to do with it next. 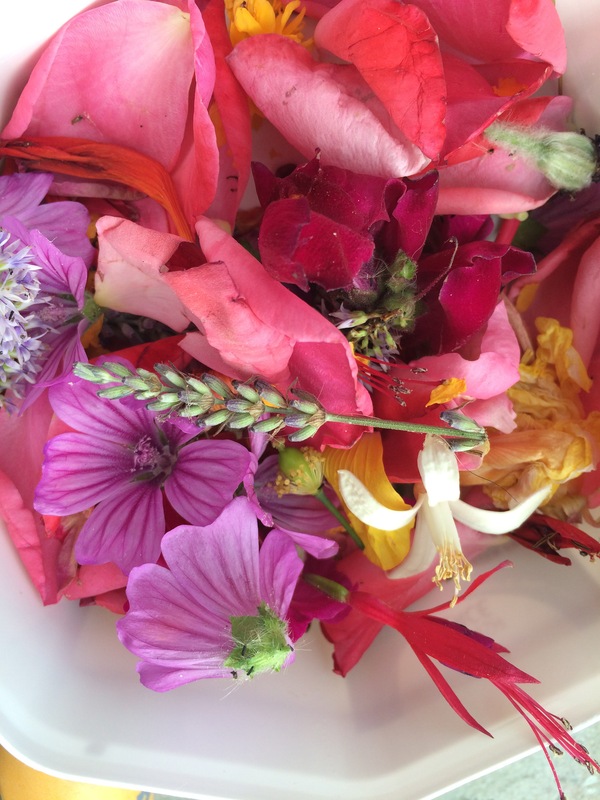 Send it with blessings to the wind, or make the pot pourri out of it, it does smell rather nice. In the end I have opted for both. I was inspired by an artist named Day Schildkret who on his walks collects things and makes beautiful sculptural earth alters from his foraged finds which he photographs. Known as Impermanent Earth Art You can see his work at http://www.morningalters.com I love his work and am perfectly happy when doing my own foraging for beautiful things. But it somehow set the ball rolling. Last night I wrote up my poems to the pc from the notebooks of my last trip it boosted my morale again finding out that I have almost reached my quota for my second book selection (a further 100 poems) and it seemed to trigger the writing again, suddenly whizzing around my head. This morning I wrote a poem about my friend who has invited me to her wedding next week. I plan to give it to her for a gift and thought that I need to do something else for them too. 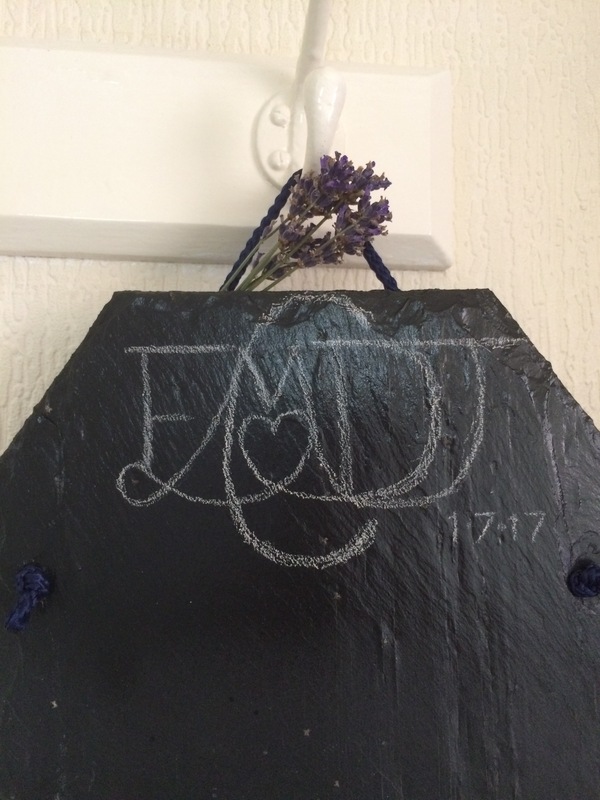 I am all for a bit of upcycled giftware and have made her a recycled roof slate chalkboard with the wedding couples initials in a logo and the date of their union. The slates were reclaimed from Scotland. I have a few of them I intended to make up for some friends and family or perhaps sell at a later date. I hope that they like it. 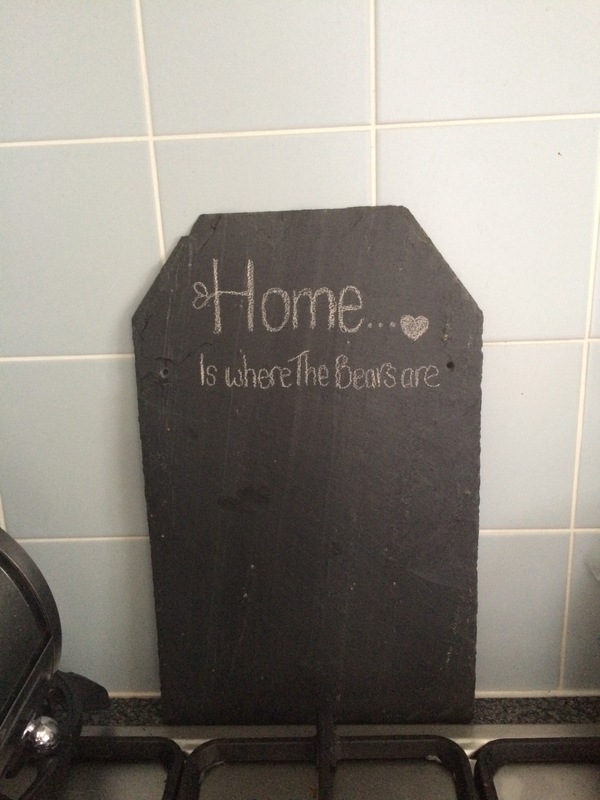 I also made one for our home which is personal to us. This has become our catchphrase of late since wherever we are as long as we are together it’s home. It seems that I have been able to write more poetry this week. Not all of it suited to a book, or here but had to be written nevertheless. I was fifteen years old when I painted this and I submitted it for my GCSE Art coursework. Unfortunately over the years it suffered with water damage and the damp when my art folder was stuck in the storeroom and so I have had to dispose of it, but took the photo before it went. After my mother’s disappointment had become apparent when we arrived at the Barcelona Pavilion, we looked for something else to do. It took only moments to find from there. Looking up we found the National Museum of Art. High upon the hill with fantastic gardens surrounding it and the most wonderful far reaching views over Barcelona city and the Place d’Espagne. The gorgeous building has so many wonderful features tucked inside, before you even get to the artwork. Although religious artifacts aren’t my thing, although there were some fabulous pieces in that section. I was particularly taken with a statue of St George, slaying his dragon. A mother and her boychild, then as I am a capricorn girl, I couldn’t resist photographing the last panel below. As we were short on time, I wanted to get to the contemporary art section. We were lucky to find that there was a contemporary art exhibition on there, with such delights including doors and furniture by Antonio Gaudi and my particular something wonderful there some sculptures and sketches by Miguel Blay whom I had not heard of before, but will definitely look at more closely. I was thrilled there was a photographic exhibition. I was cheeky enough to get a few pictures showcasing Marianne Breslauer’s career spanning the years 1927-1938 beautiful images of ladies for good measure before closing time, along with a few more monochrome shots from other photographers. Lots of other photographs caught my eye, including a rather lovely picture of a starlet from a golden era. 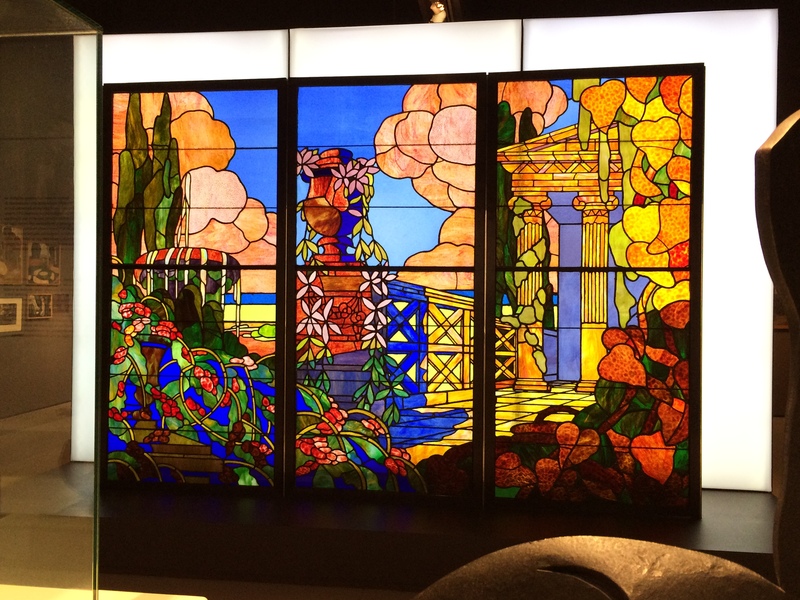 There was a beautiful stained glass panel which I just have to share with you here, unfortunately I do not know who created it. But I must admit that glass is another of my weaknesses. As we left the gallery, we were met by the most beautiful sky and sunset. Like most of the other people who were leaving, we took photographs not of ourselves, just the scenery around us, it was exquisite.